THANK YOU for every single thing you did to make a difference for animals in 2016! This list is about the animals and to honor animal rights activism. Congratulate yourself for your contribution and get inspired to do even MORE for animals in 2017. Please SHARE this link! We know there are many more victories and many more good news items for animals in 2016 and we know there are LOTS of opinions of what "victory" or "good news" mean. This is a listing of what was posted as good news/victories on our All-Creatures.org 2016 weekly eNewsletters. Please subscribe here. Image above to celebrate Ringling Bros. LAST Elephant Show, May 2016! Elephant Aid International has closed on ERNA - Elephant Refuge North America! 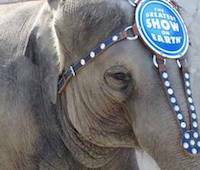 "Cows, chickens, pigs, turkeys...they were calling me"
Six Flags (Vallejo CA) Ends Elephant Rides! Creature Conference: Is Christianity Good News for Animals? I only eat free-range, cage-free, and locally-raised animal products. Isn't that good enough? Hey, What if Factory Farming Were THE ONLY THING Anyone Worked to End? Four Paws officially closes World's Worst Zoo! The Save Movement continues to inspire vigils! Kaavan Going to a Sanctuary! The Next Generation of Wild Orangutans is Born! Vegan Food Now at TX Rangers Ballpark! The Great Octopus Escape – and Others! Mongo...Abandoned Toothless Monkey Finds New Home at Jungle Friends! Operation Henkaku: The Killing Cove is Closed for Business – Let’s Keep It That Way! Wimbledon to Hold Last London Dog Race in June! What breathes and bleeds, but doesn’t suffer or feel pain? New Law Bans Class B Dealers! VICTORY! New Law Bans Class B Dealers!